Santa Clara, California – A tech epidemic is sweeping the nation. Millions of iPhone users are suffering from a dastardly affliction without even realizing it. They open up app after app on their phones to check in and earn a deal at the Gap, win back mayorship of their favorite bookshop, or gain a Barista Badge from their local Starbucks. By the time they finish checking in to all these services, they are dazed and tired with sore thumbs to boot. These poor check-in-oholics are suffering from CIFS, or “Check-In Fatigue Syndrome”. Fortunately, there is a cure, and that cure is Footfeed. This intuitive app brings “check-in economy” to the iPhone, allowing users to check-in to multiple location-based services – Foursquare, Google Latitude, Brightkite, and Gowalla – with one click of a button. Deals from each service show up with one click, no longer forcing people to check in first and see a “deal nearby.” Even specialized deals from services like the Pepsi Loot program are included, with more deals being added from networks daily. Footfeed’s latest 2.0 update allows check-in fanatics to enjoy perusing comments and tips of hip new places in their vicinity. Its improved location-matching system ensures accurate check-ins without having to deal with duplicate locations from each network. And of course, Footfeed still has the ability to post one’s location to Twitter and Facebook. The Stats screen allows users to view their check-ins, points, badges, stamps, and more all in one place, and a Friends page lets them view buddies’ stats and recent check-ins. 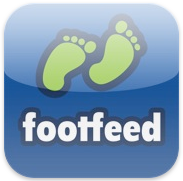 Footfeed is free and available worldwide exclusively through the iTunes App Store in the Social Networking category. 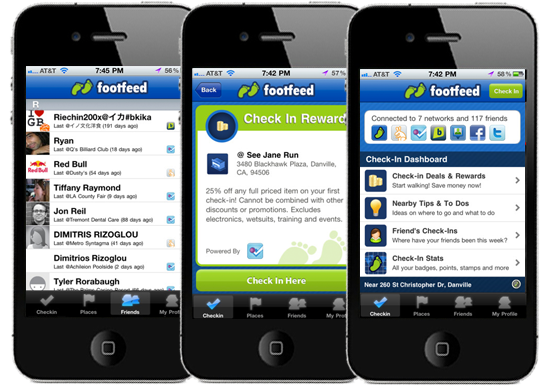 Footfeed is a location-based check-in aggregation platform and multi check-in app founded by Dennis Mink and Ben Floering, two self-proclaimed check-in’aholics. With Footfeed, users can check in to Brightkite, Foursquare, Gowalla, Facebook, Google Latitude and Twitter simultaneously, while earning badges, points and rewards from each service. Footfeed also offers a public API and white label multi check-in service that makes it easy for a company to add multi check-in to their existing apps. Copyright (C) 2010 Footfeed. All Rights Reserved. Apple, the Apple logo, iPhone, iPod and iPad are registered trademarks of Apple Inc. in the U.S. and/or other countries.